The Wall and Settlement Resistance Committee filed an appeal to the Israeli Supreme Court, on Sunday, denouncing the Israeli government’s seizure of 1,200 dunams (297 acres) of Palestinian-owned land to south of Bethlehem, in the southern occupied West Bank. The head of the committee, Hassan Bureija, told Voice of Palestine radio that the Israeli government granted 1,182 dunams (292 acres) of the seized land to the Israeli Ministry of Construction and Housing, as a foundation for building an illegal Israeli outpost in the area. According to settlement watchdog Peace Now, in the two years since United States President Trump took office, some 14,454 units in the West Bank have been approved, which is more then three times the amount that was approved in the year and a half before his inauguration (4,476 units). Between 500,000 and 600,000 Israelis live in Jewish-only settlements across occupied East Jerusalem and the West Bank in direct violation of international law. 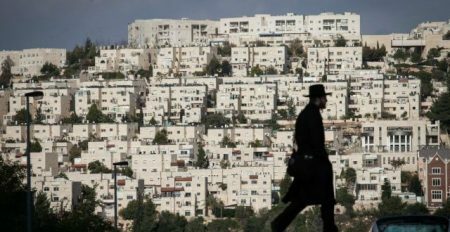 An estimated 196 governments have recognized all Israeli settlements scattered across the Palestinian territory as illegal under international law.